I never know exactly what I should write. That and knowing I get easily distracted and waste valuable crafting time on the internet keeps me from blogging regularly. I finally finished a little table center for our breakfast table. It was put on hold because it took more thread than I thought it would. I used a second dyelot and worried it wouldn’t match. I decided to finish it and then over dye it, which wasn’t necessary. The slightly more golden dyelot is in the points, so it blends. I love Cebeliia thread. It has never let me down. This one is made with a 1980 pattern from Japan. I decided to try and loosen my gauge and use a size 10 hook and my favorite size 30 thread. I usually use a 12 hook. I don’t like working in the looser gauge, but the crochet blocked out thinner and more delicate than my other lace doilies. 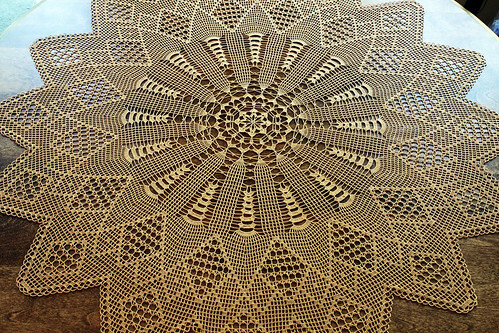 The doily is 36″ in diameter and the table is 42″. 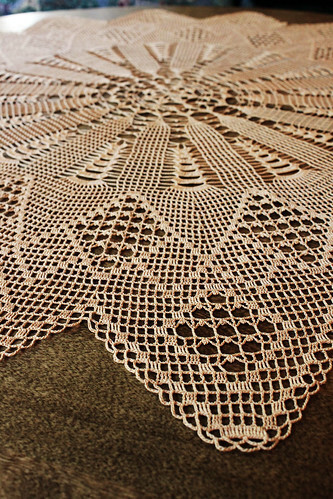 I plan on sewing a dark green table cloth to go underneath the gold of the doily. I am still sewing a bit too, and playing with machine embroidery designs. 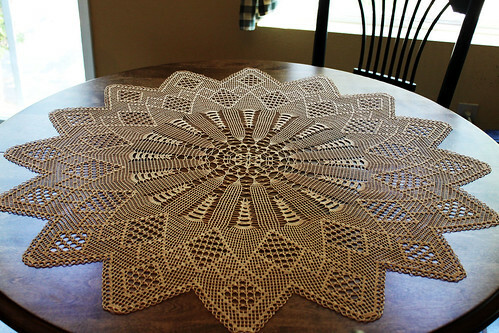 I have several almost finished items like this doily. It feels really good to have this one finished. This entry was posted on Friday, June 28th, 2013 at 12:13 pm and is filed under Craft, Crochet, Doily, Lace and Needlework. Tagged: Craft, Crochet, Doily, Lace, Needlework, Sewing, Thread. You can feed this entry. You can leave a response, or trackback from your own site. This is really beautiful Joyce! Love the color, love the pattern!